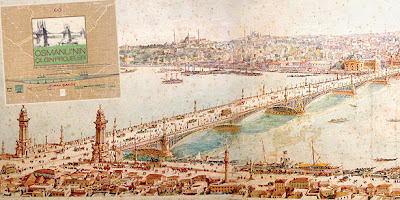 As the Ottoman Empire -- one of the largest and longest-lasting empires in history -- entered the modern era, a great many architectural projects were developed at the request of the sultans, who showed great interest in the construction of canals, railways, bridges and funiculars. These projects have recently been compiled in a visually rich and informative book, “Osmanlı’nın Çılgın Projeleri” (The Crazy Projects of the Ottoman Empire). The book includes photographs and drawings of the projects, many of which remained on paper without ever being transformed into reality. The writer, Turan Şahin, says in the introduction to his book that Ottoman rulers committed themselves to providing social facilities such as fountains, bridges, railways and train stations for public use. Public service was not only regarded by the sultans as a duty, but also a means of receiving benediction from the public. Many foreign experts were employed by the sultans to develop projects and improve the urban design of cities under Ottoman rule.